SUPERSTAR midfielder Emma Kearney has added another accolade to her collection after being named North Melbourne's first AFL Women’s captain. Kearney, 29, was the AFLW best and fairest playing for the Western Bulldogs in 2018 but crossed to expansion club North Melbourne during the off-season. The midfielder has previously captained VFLW side Melbourne University. 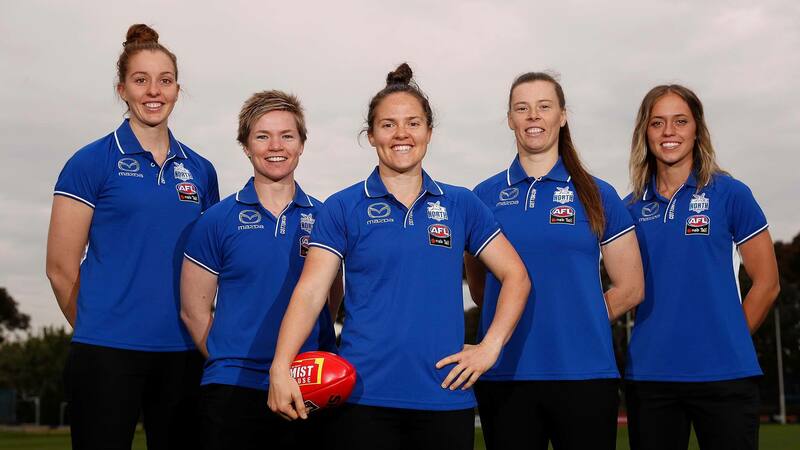 She will be supported by vice-captain Brittany Gibson, deputy vice-captain Jess Duffin and leadership group members Emma King and Kaitlyn Ashmore. Midfielders Gibson and Ashmore joined the Kangaroos after playing for Brisbane in 2017-18, while forward Duffin and ruck King moved to Arden Street from Collingwood. "I'm really proud to be North's first AFLW captain – it's a great club," Kearney told AFL.com.au. "[North] is super genuine about women's footy and diversity and is a great community club, so I'm really honoured." Kearney has worked at the club as the sport and recreation co-ordinator for The Huddle, North Melbourne's community program, since April. Having stepped away from her cricket commitments at WBBL club Melbourne Stars, she will be spending all of her time at Arden Street. "The oval's in good nick at the moment, so it's nice to come out in my lunch breaks and do a running session or use the gym," Kearney said. "I sometimes worry about spending too much time here, but I've had discussions with my boss already, so if I need to work from home just to get away from the place, I'll do that. "But to be honest a lot of the time I'm out in the community delivering programs, so I don't spend a lot of time at my desk." Kearney said the five-strong leadership group had a broad variety of personalities. "Britt is just an absolutely ripping person. Kaitlyn Ashmore said one of the big reasons she came to North was because of Britt's decision to move as well. She said Britt was the heart and soul of the Lions," she said. "I expect she'll be no different at North and will have a big impact on the Tasmanian-based players in particular, knowing them quite well already. Having her bubbly personality around is going to be great. "You've got Jess and Emma who are very thoughtful, hard people. They'll make tough decisions, they'll pull people up and challenge them, not just the players, but the coaches as well. "Then you've got Kaitlyn, who's the softer type. She's probably the more social one of the group, but that'll be a good dynamic for us. If the younger players are a bit intimidated to speak to one of us, they've got Kaitlyn." The unorthodox move to announce a leadership group and captain before pre-season training was done to provide new players with a voice and peer support from the outset, rather than just before the season begins in February. The Roos start their pre-season on November 15. Players (excluding those who were yet to be drafted) were invited to self-nominate for the leadership group, completing an application which involved identifying their leadership strengths. Nine of 24 players applied. A team including coach Scott Gowans, head of football operations Laura Kane, AFLW football operations manager Matt Bolitho, list manager Rhys Harwood and club CEO Carl Dilena then chose the leadership group. The four unsuccessful players were also given individual plans to develop their leadership skills. Although she’s now living in Melbourne with partner Jaime and their six-week-old son Henry, vice-captain Gibson has close ties to the seven Kangaroos who’ll be training at home in Tasmania, having grown up and played a lot of footy in the state. "It was an absolute privilege when Laura (Kane) rang me on Wednesday and asked me if I would accept the vice-captaincy. It's a huge honour to lead such a great group with Kearney at the helm as well. The girls are great, so it'll be really fun," Gibson said. "I love that we can go home and play in front of family and friends in Tasmania. I loved my time in Brisbane, but I'm a true-blue North Melbourne supporter, so I've got strong connections to the club. "Playing for North Melbourne is what I've dreamed of since I was a kid. To top it off as vice-captain is wonderful. I know my family is very happy and proud – as am I – to put on the colours and hopefully I can do well."